Wednesday, April 24, 2019, 8:45 a.m. – 10:30 a.m.
Top Dressing Wheat: growing degree day models help optimize nitrogen application timing. Figure 1: Growing degree accumulation (GDD: max = 86F; min = 45F) for various planting windows between this year's storms. These may vary slightly between areas like Dixon, Zamora, and Davis. Much like other parts of California, the Southern Sacramento Valley has seen some substantial rainstorms this season. The weather patterns left growers with a few narrow planting windows spread out over the last two months. This combined with the fact that growing degree day accumulation has been steeper than average (largely due to warmer nights) means that wheat growth stage can vary significantly from one field to the next. Now would be a good time to assess wheat stand, weed pressure, sample for soil nitrate levels, and start planning for nitrogen applications as fields enter the tillering phase of development. Nitrogen budgets are becoming more of a norm for California growers, and more than ever it's important for growers to get the greatest return for their nitrogen applications. One fertilizer management approach that can improve both yield and nitrogen use efficiency is to shift nitrogen applications from being mostly pre-plant to mostly in-season. 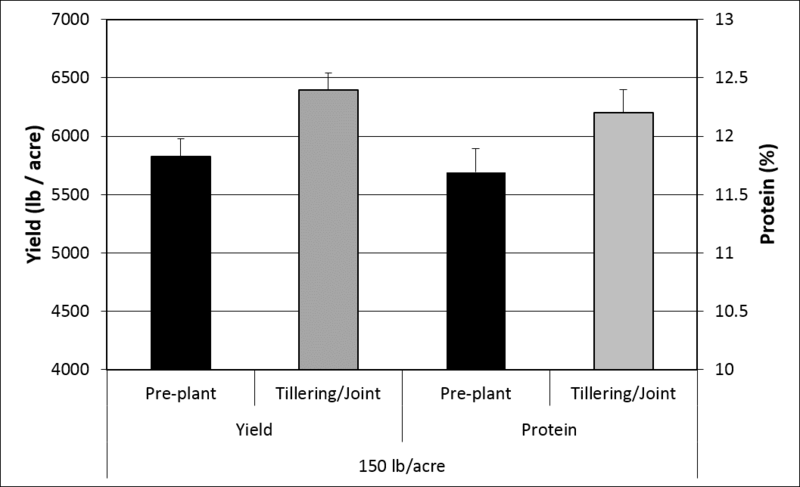 Research from the University of California has shown that in-season applications of nitrogen applied from the tillering to the jointing stage resulted in higher wheat yields and grain protein concentrations than pre-plant applications (Figure 1). This is something to keep in mind as we approach the winter growing season. After a dry beginning to the season wheat growers might be trying to decide how to proceed with their nitrogen fertility program. If not irrigated, most wheat planted in the Sacramento Valley during November will likely have been stunted by the relatively dry conditions during the second half of November and throughout December (see Fig. 1, below). Some of the crops out there may need to be replanted entirely. If you're trying to work out how your stand is doing, consider some population sampling.